I feel like I've always been a tomboy at heart. I grew up climbing trees, racing my bike around the block, and playing football with the neighborhood kids (I was a bomb receiver). I didn't really know about makeup or hair until I was in high school and my idea of dressing up was wearing a pair of jeans that didn't have any tears or scuffs on them (and trust me, they were not the intentional fashiony kind of destruction). Honestly, if you had told 13-year-old Ariel that she'd become a fashion blogger one day, I would've laughed in your face...and then ran away dribbling a basketball or something. 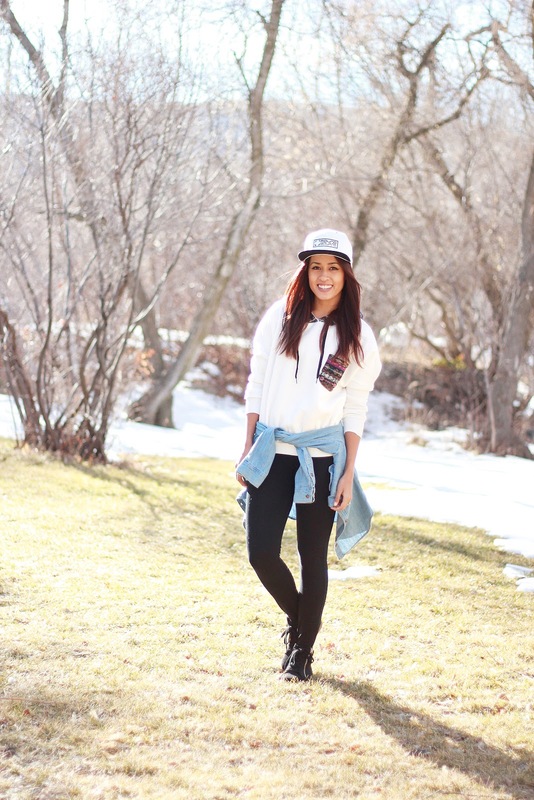 Because of my childhood roots, I feel like I sometimes gravitate towards "tomboy-chic" outfits. Don't get me wrong, I still love dressing up in a cute top and fitted jeans, but there is something nostalgic about wearing an oversized hoodie and a snapback that takes me back simpler times. Today I have RoundSquare to thank for my nostalgic outfit! They're a new and upcoming company that offers super chill merchandise, like beanies and caps. One of their mottos is "What's your angle?" because they believe that embracing our differences is what makes us each uniquely special. We all see the world in our own "angles" and they want you to express that! They don't currently have a website yet, but it's in the works and in the meantime, you can follow them along on Instagram at roundsquareco! I'm sensing some Netflix and fast food in my near future. And I'm usually always right. Love it. Can't beat a good ol fashion hat and hoodie! What a cool motto RoundSquare has!